Pressure dropped … Call evacuator? cling «on a tie»? or to try to crawl to service by yourself? And can special medicines added to oil help here? Sharp pressure drop is mortally dangerous both for people, and for motors. Certainly, the motor is much easier to reanimate – if there were extra time and money. But the emergency indicator of oil pressure will not necessarily turn on somewhere near an auto repair station – as an ill luck it would flash on a far away country path. Far away from civilization, the help is nowhere to come from ... Is it possible to anticipate optional rescue actions in this scenario? As if on a dry! The task is to help the car which has lost engine oil, to creep as long as it is possible. There are a lot of speculations on this subject, unfortunately. Someone somewhere has run with flashing indicator almost thousands kilometers. But now there is no time for jokes. How long can VAZ “Fivers” (VAZ, model 2105) run without oil, we have already checked (Za Rulem. 2008. Iss. 1). We carried out bench tests (Za Rulem. 2009. Iss. 5). One thing became clear: engines which were processed previously, behaved not as the usual. Let's notice at once: the thing is not about additive compounds to oil! Used additives are called differently: tribo-technical structures. 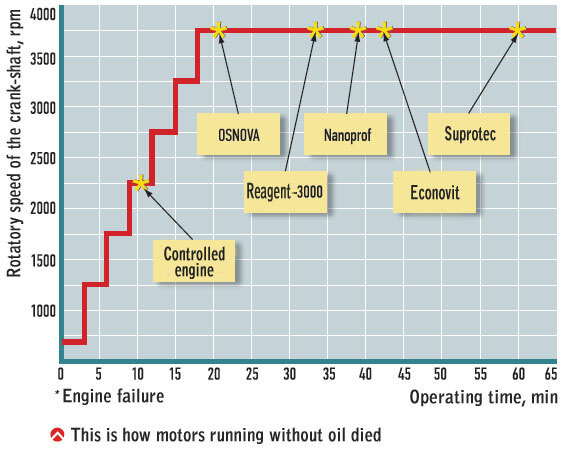 The difference from oil additive compounds is that these structures aren't intended to change qualities of engine oil (unlike usual additive compounds): tribo-technical structures influence conditions and properties of working surfaces in the friction knots of the engine - bearings of a bent shaft, cylinders, buckets, piston rings. But after all they are the details which suffer in case of sudden loss of oil compression in the engine! Is it really true that anti-frictional and anti-burring properties which are gained in friction knots, are so powerful, that will allow the motor do without oil? For how long? In what modes? This is what we will check. 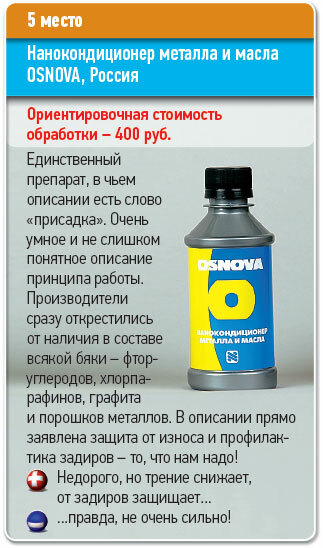 Additive compounds, which declared sharp increase of wear resistance of the engine, gathered five: the Russian OSNOVA, Suprotec (Nanoprotec), "Reagent-3000, Ekonovit» and German-Russian «the NANO Motor Refit SET KFZ » (further - Nanoprof). Now about the sad... For purity of the experiment required to provide equal operating conditions of additive compounds. It means, initial engine oil, working modes and the most important, the initial condition of the engines should be identical. And how we can provide this? After all, as the experiment requires, all the motors should die as a result! So, six motors - five after processing and one pure, without any preparations, the controlled one. The toad smothers you, but we have to! The identical VAZ 1,5L-engines which have passed through the capital repair. All details from the same firms and even from one parties of delivery. Ritual victims are ready; we begin dancings round the stand. Gloomy priests dragged motors on the stand. First, the controlled motor, it will be our starting point. But the motor is fresh, right after repair, it is inhumane to kill it immediately. We shall start the 20-hour cycle - as the AvtoVAZ doctor prescribed, starting with idle and finishing with decent loads. Two hours after the start we took the initial characteristics, after twenty hours of work – final characteristics. At the same time we evaluated how running affects the power and fuel consumption. It is also interesting information. Then, followed by the shamans’ drums, we began killing. Warmed up the engine, stopped them, drained off the oil, and then started again. Gradually increased the speed. 800 rpm - three minutes we held this mode, the oil pressure = zero, the flight is normal. 1500 rpm - three minutes, the flight is normal ... 2000 rpm - three minutes – still handling … finally heard some obscene sounds ... 2500 rpm - forty seconds, and the motor is died. The priests strum the switches - the victim is autopsied. Cause of death - crank of the main bearing. The following specimens were subjected to similar torture. But after two hours of running on the same cycle, they were processed with lubricants - each got its own. With the strict observance of the instructions. Somewhere the instructions are simple – pour and go; somewhere it required two bottles, along with oil change. "Reagent-3000" even asked for three treatments. We compared the characteristics of the motor before and after treatment. So besides the murder, we have received important information about the influence of the lubricants on the quality of engine running. Right away we mention: all the lubricants, have raised rates the engine’s performance in varying degrees. 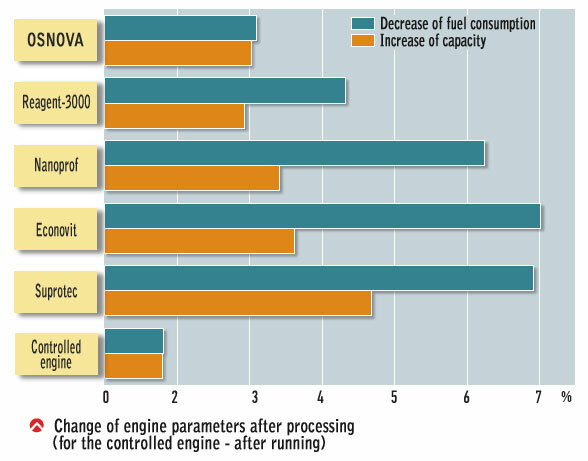 Suprotec reduced fuel consumption by about 7%, and raised the capacity by 3.5%. 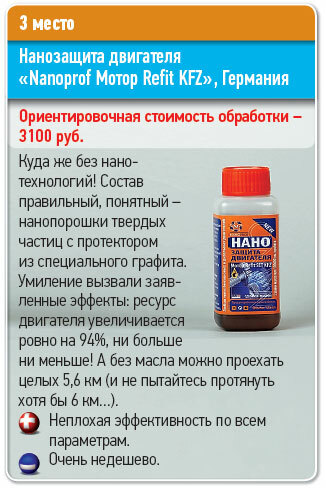 "EcoNova" and Nanoprof gave similar results, and well done «Reagent-3000." The usual fair running of the controlled motor is also improved its performance, but less noticeably. Here's food for thought on the topic "whether to run or not run and if to run, then how?". Summary of results are in the graph. They died but differently. The controlled motor hardly crawled to 2500 rpm. but all engines processed by lubricants, survived until 4000! The first was the examinee who has tried means of OSNOVA, - without oil it sufficed for 21 minutes, from which during two it worked on 4000 rpm. The following lost was the motor treated with "Reagent-3000": 34 minutes, 16 of which fell on high turns. «Econovit» and Nanoprof acted the same: the first let the engine die slowly and sadly on the 42nd minute of the torture, the second - on the 40th. And protection of Suprotec sufficed on one hour of work without oil for 42 minutes of which the motor turned on 4000 rpm! When opening we found on pins obvious traces of overheat – of course! The reason of all the failures was turning out of the connecting rod liner. But the rings, cylinders, buckets are fine – as though put them again in the motor at once, fill in oil and drive! Opening showed that processing engines with lubricants didn't cause any damage. Moreover, those surfaces of details which rub in the process of work, in the controlled engine looked worse. And performance of the motors after running confirmed it. It means that application of good tribo-technical lubricants (not additive compounds!) gives us advantages. And in case of emergency protection of the friction surfaces which is strengthened by these lubricants is capable to help properly. We wouldn’t recalculate working ours into kilometers of run – there are too many random factors. It is also clear that in case emergency it is not necessary to overload the motor to a limit of possibilities. Therefore, if the described above trouble happens try accurately, without sharp speed increase, (it is desirable that the car is empty) to creep out from the woods or where you were skidded. Sometimes it will save not only the motor –but your own life. By the way, good advice: don’t stop the motor! Surfaces of bearings are warmed up too much without oil cooling and they can become blocked, and then, when you start the engine, the pro-collar of liners is inevitable. Here without the wrecker precisely you will not manage. And it is better not to get to such situation that we sincerely desire! BEFORE OR AFTER? TO FILL IN OR NOT TO FILL IN? To apply saving remedies having found the oil pool under the car is absolutely useless. The motor should be processed only in advance (it is rather long procedure). That is tested means are preventive are not reanimation. The only preparation, which description doesn’t contain the term "additive compound". The description of a principle of work is too clever and not too clear. Producers disowned at once from existence of any baddy – fluorine carboneum, chlorine paraffin, graphite and powders of metals. In the description they insist on protection against wear and prevention of burrs – that is what we need! Minuses: … not so effective! As we see from the description, it is the terrible mixture of artificial and natural minerals, salts and other compounds of the metals, different acids, rubbers, polyamides and … there is sulfur! All organic and inorganic chemistry is presented in this type of "know-how" and is poured in three bottles of this structure. Protection against wear is declared on the first place in the description – it means, this is our client! Pluses: effect is noticeable, and for rather small price. Minuses: there are three stages of processing along with oil change – too complicated. And sulfur in structure is a warning: nowadays they take it away from oils! Pluses: Quite good efficiency in all respects. The structure it is very similar to the previous, German preparation. And it works in all respects also well. But is cheaper in one and a half time! And on quality of packaging and the detailed instruction equal to it isn't present. They even gave us a pen as a gift! Pluses: The clear and informative instruction, beautiful packaging, the form confirms the contents. The preparation is familiar because of the last tests so we weren't surprised by a good result. The formula isn't specified, but the main thing – how it works! An hour without oil on a serious mode - this is strong. The price is quite real –not cheap, but taking into account received pluses fair enough. Pluses: The best result on protection of the engine at failure of system of greasing made it the leader. Minuses: Two-stage processing along with oil change – it is troublesome. To those who need help in it.